What are Spirit Airlines' baggage allowance and baggage charges? Read on to find out. Spirit have made it costly for passengers to travel with any substantial piece of luggage. So why not avoid the need for luggage altogether by shipping your luggage with Send My Bag? The added bonus is that you don't have drag your bags around yourself but can enjoy a luggage-free journey. By sending your bags you can enjoy having all the things you need at your destination while also enjoying cheap fares on budget airlines like Spirit. Get your free quote for sending your luggage. The Spirit Airlines carry-on baggage allowance is one small personal item; 18 x 14 x 8 inches (45 x 35 x 20 cm). A fee applies to bring an additional, larger item, with dimensions of 22 x 18 x 10 inches (56 x 46 x 25 cm). The fee for bringing an additional item on board varies according to when the allowance is purchase - at initial booking, before/during check-in, at the airport, or at the gate. For most flights the fee is $37, one way, as standard, if purchased during online booking, or before online check in. If a passenger is a member of the $9 fare club*, they can purchase their carry-on allowance for $28. If, however, the allowance is purchased during online check-in, the cost is $45 as standard, or $36 for fare club members. The price increases to $55 at the airport, or $65 at the gate. A number of items do not count towards a customer’s carry-on allowance, such as a diaper bag and a pushchair. What If my Spirit Airlines Carry On is Overweight/ Oversized? 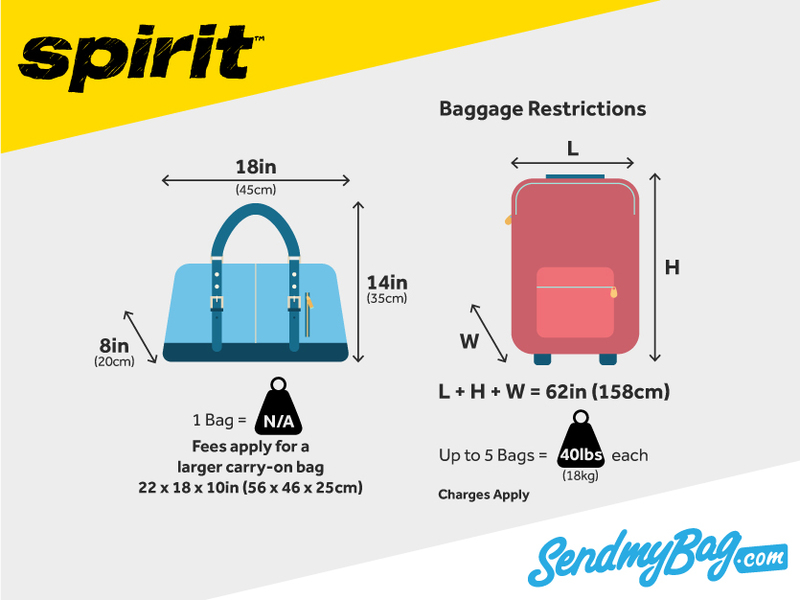 If an item of hand luggage exceeds the dimensions permitted by the Spirit Airlines baggage allowance, it will be checked into the hold, and fees will be charged (see below). Certain pets can be carried in the cabin on domestic Spirit flights. The pet must be placed in a carrier with dimensions no larger than 18 x 14 x 9 inches (45.72 x 35.56 x 22.86 cm). The combined weight of the pet and carrier must not be greater than 40 lbs (18.14 kg). One pet container per customer is allowed with up to two similar animals in the same container, providing each pet is free to stand in an upright position and freely move about the container. The fee for this is $110 per container. Passengers may bring musical instruments on board as part of their standard carry on. If the instrument exceeds the standard carry-on allowance, an extra seat must be purchased for it. The instrument cannot weigh more than 170 lbs and must be secured in or against a window seat. There is no free Spirit Airlines checked baggage allowance. Passengers can check up to five bags into the hold but must pay a fee. Each bag must not exceed 62 inches (158 cm) in total dimensions, or 40 lbs (18.1 kg). *Customers can pay $59.95 to become a member of the $9 fare club. This means that they, and everyone on their travel itinerary, can receive discounts on their flights and baggage allowance purchases. Membership renews automatically every year at $69.95, unless cancelled by the customer. Pushchairs and child car seats are accepted in the hold free of charge. If a bag weighs between 41 and 50 lbs (18 and 23 kg), the fee is $30 per bag. If a bag weighs between 51 and 70 lbs (23 and 32 kg), the fee is $55 per bag. If a bag weighs between 71 and 100 lbs (32 and 45 kg), the fee is $100 per bag. If a bag’s dimensions are between 68 and 80 inches (158 - 203cm), the fee is $100. If a bag’s dimensions are over 80 linear inches (203cm), the fee is $150. Sporting equipment, like surf boards or bikes, may be checked into the hold. The fee for checking a bike is $75, one way, and $100 for surf boards (max 2 in one bag). Golf bags and skis/snowboards are viewed as standard items of checked luggage. Musical instruments can be checked into the hold, as long as they are correctly packaged and they adhere to Spirit’s checked baggage allowance rules. Looking for Spirit sized hand luggage?